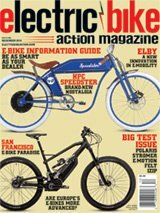 SRAM has just announced the first dedicated component group set specifically for electric mountain bikes. SRAM’s 1x technology is built into this set, and the EX1 cassette allows optimal steps between cogs for better shifts and the best gear range for mid-drive eMTBs. The EX1 X-Actuation Trigger Shifter has been engineered to deliver one perfectly accurate shift at a time, which takes a lot of pressure off the drive train. Multiple shifts too quickly, because of the strong forces on the drive train from the electric motor, can damage the drive train. It can also lower battery performance. MSRP is $48. The EX1 E-Crank is lightweight, durable, stiff and designed specifically to work with Bosch, Brose and Yamaha mid-drive motors and bottom bracket interfaces. MSRP is $50. The EX1 X-Horizon Rear Derailleur capitalizes on the robust build and precise shifting attributes of the X-Horizon design, to create the world’s first derailleur specifically made for e-MTBs. Engineered to handle high-torque, low-cadence shifting across the 11-48-tooth E-Block cassette, the EX1 derailleur gives e-MTB riders clean, confident shifts so they can spend more time enjoying the ride. Its design reduces shift force, ghost shifting and chain slap. MSRP is $142. E-BLOCK shifting technology is a fundamental redevelopment of external drivetrain shifting. On the E-BLOCK cassette, the chain has a defined link position on each cog. Cog architecture has been engineered to work with both inner and outer links of the chain, which allows extremely refined shifting for both inboard and outboard shifts. The result is precise and robust shifting performance in any situation, even with full motor support. The 11-48t, 8-speed cassette is machined from case-hardened tool steel. Its gear range is optimized for mid-drives, and has increased chain wrap on climbing cogs. Big steps between cassette cogs specifically engineered for electric mountain bikes. MSRP $390. Built with the needs of E-MTB riders in mind, and incorporating the same X-SYNC chain management technology found in every SRAM 1x drivetrain, EX1 offers 14-, 16- and 18-tooth sprockets for Bosch motors. MSRP $20. More information is available on the SRAM website.